Ok, ok, I promise this will absotively, posilutely be my LAST pumpkin recipe. For a while anyway. But this week's Carnival of the Recipes (which will be hosted right here, btw) is a Halloweeny theme. So it behooved me to post something appropriate for a Halloween party. This is a recipe I scavenged from a party I attended, actually. It was such a big hit, this poor lady was inundated with requests for the recipe. It would also be a really great change if you're wanting to do something other than traditional pumpkin pie for Thanksgiving. It's in the same family as pumpkin pie, but much better, IMO. I made this last night as a tester, and it's a definite winner. Too bad the hubs doesn't like pumpkin. I guess I'll have to eat it all myself. Heheh. Preheat oven to 350°. Beat eggs in a large bowl. Add pumpkin, sugar, salt, spices, and evaporated milk and mix well. Cover the bottom of a large cake pan with granola. Pour pumpkin mixture gently into pan. Sprinkle dry cake mix over the top of the pumpkin mixture. Melt butter (1 stick wasn't enough for me, I used about 1 1/2 sticks) and drizzle over the top of the cake mix. In a small bowl, stir together chopped nuts with 1/2 cup sugar and 2 tsp cinnamon. Sprinkle over the top. Bake for about 1 hour. NOTE: I had to bake an additional 30 minutes! Be sure to test with a knife inserted into center. It should come out clean. Serve with ice cream or whipped cream, although just plain is really delish too. This type of recipes are always good to give your loved ones little of that love back beause is ery comforting to see this very delicious and easy. For thanksgiving celebration is something good but I don't like pumpkins at all... 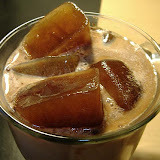 I think that I going to try some of it, maybe is different as a desert..
Definetly a realy different and tasty option!! I'll have to try it before thanksgiving of course but totally worth it!! Vicki, let me know how you like it! Gena, I think the maple flavor would work very well with the pumpkin! I haven't tried that, but it sounds like it would work. Sounds delish! I have maple granola from Trader Joes... would that work, or do you think it would make it taste funky? 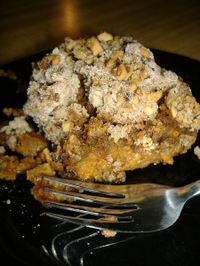 Sounds like a dump cake, but with pumpkin and spice cake. Yeppers, I sure do! I'm looking forward to seeing what you posted! Nice! I hope this gets lotsa exposure via the Carnival of Recipes. Hey pumpkin recipes can never be enough...there are a lot of pumpkin lovers out there who are looking for many new recipes. And for Thanksgiving trying out new recipes are always fun. Well to find many more related and useful resources you can definitely visit this Thanksgiving Blog at http://thanksgiving4all.blogspot.com. It's loaded with interesting stuffs and ideas which will spice up your Thanksgiving celebrations.